Cineplex Calgary - Wanna Catch a Movie Tonight? Check out the Cineplex Calgary movie theatres near you if you wanna know where you can see that hot new film. Ciniplex may be the largest Theater Corporation in the area. 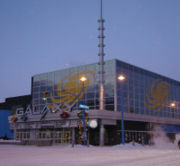 Cineplex Entertainment LP of Toronto operates large multi-screen movie complexes in such places as Calgary, Alberta. Nathan Taylor, the inventor of the multi-screen theater, and Garth Drabinsky opened the first Cineplex in 1979. The Cineplex showed us the largest screen size for years and started up in the basement of the Toronto Eaton Centre. With competition between Cineplex, Famous Players and Canadian Odeon heating up, Cineplex decided to purchased Canadian Odeon to become a major participant. And then with the help of the Bronfman family, Cineplex and Famous Players became a highly powerful duopoly. Cineplex grew to over 130 locations with more than 1200 screens, making it the largest Theater Corporation in Canada. Famous Players has felt the squeeze, but you can still visit the Famous Players Paramount in Calgary. Keep your eye on the Paramount Chinook location as well. See this map for the movie theatres, including Calgary Cineplex locations. If you find the crowd too much or cannot get to your favorite Cineplex location, you can choose one of the other cinemas located nearby, such as the Canyon Meadows site. Paramount Chinook Mall Calgary on MacLeod Trail S.W. Getting to the movie is easy enough, with multiple roadways, maps, bicycle routes, and public transportation to help get you there. While on your way to the movies or after enjoying a great film, why not stop off for additional Calgary entertainment at one of the local stores, nightclubs, festivals happening or simply take a moonlight stroll through town. If you happen to have caught one of the earlier shows and have daylight left, go grab some food to go then hit up one of the local parks. If the movie has left you restless and wanting more then why not wander on over to the neighbourhood pub or have dinner in one of the beautiful restaurants nearby. By taking in a film at one of the Cineplex Calgary theatres, you open yourself to a wide variety of other fun things to do. Sometimes going to the theater nearby is simply convenient but why not go across town and hit a few stops on your way there or on the way home. Make a day of your movie going adventure. Go back from Cineplex Calgary to the Calgary Downtown Map webpage, or feel free to comment on this article below.